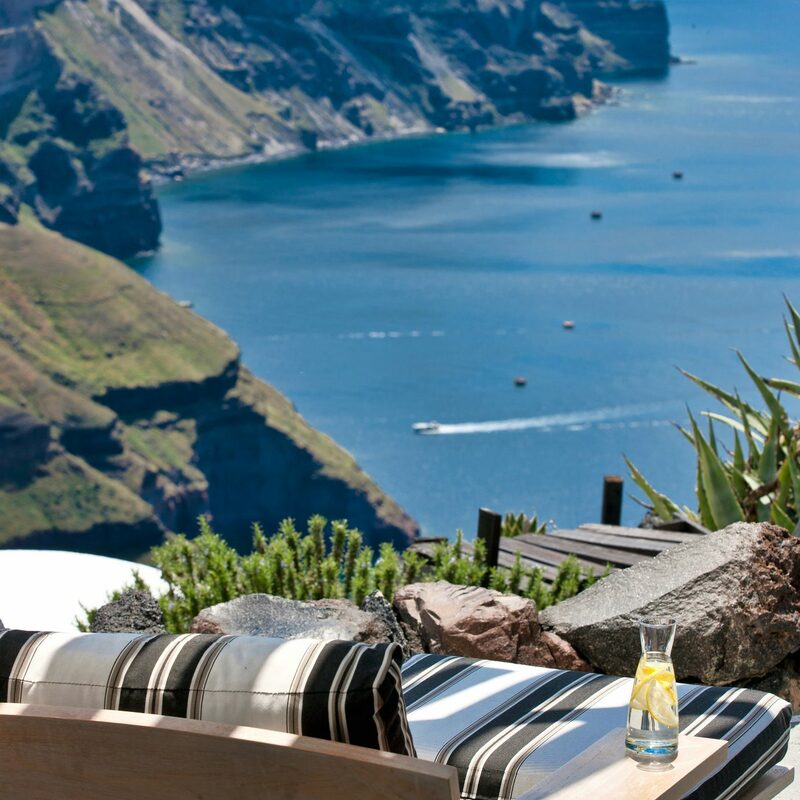 This sunny volcanic island has earned its reputation as one of the world’s dreamiest honeymoon destinations. 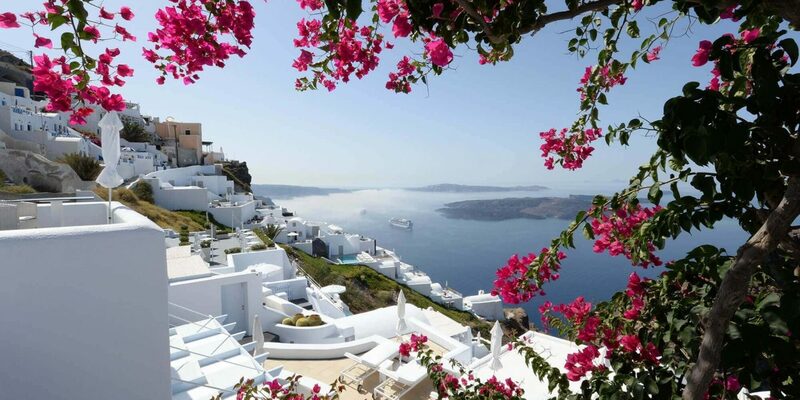 Are you, like so many couples before you, ready to fall under its romantic spell? 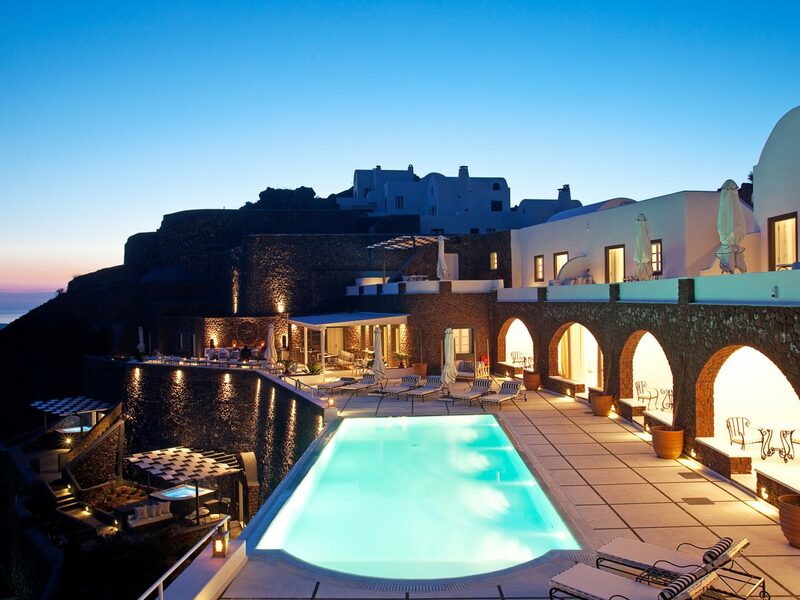 Start by booking one of the best honeymoon hotels in Santorini—and let those Aegean sunsets take care of the rest. 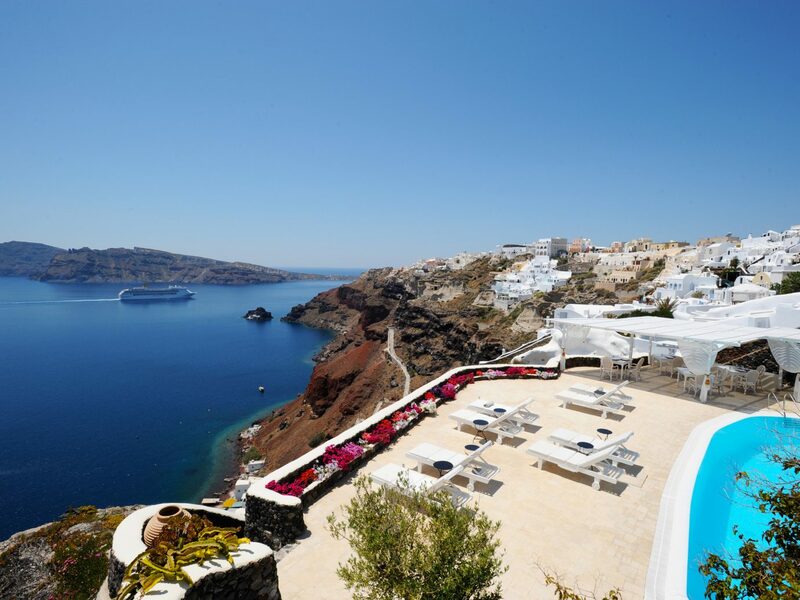 Whoever coined the term “honeymoon hotel” was surely sunning by the infinity pool at the Grace Santorini. 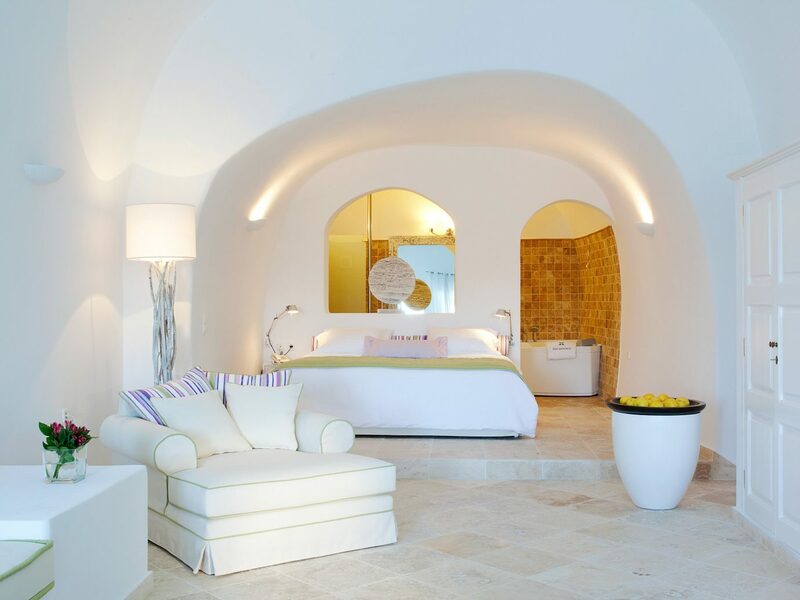 This dreamy seven-level boutique has gotten romance down to a science: each of the 20 all-white guest rooms feature Greek marble, fragrance menus, and a private plunge pool; the five-course breakfast menu includes champagne (there’s also a Champagne Lounge with its own agate bar for celebratory toasts); and the aforementioned infinity pool is the stuff of legend. Going all out? 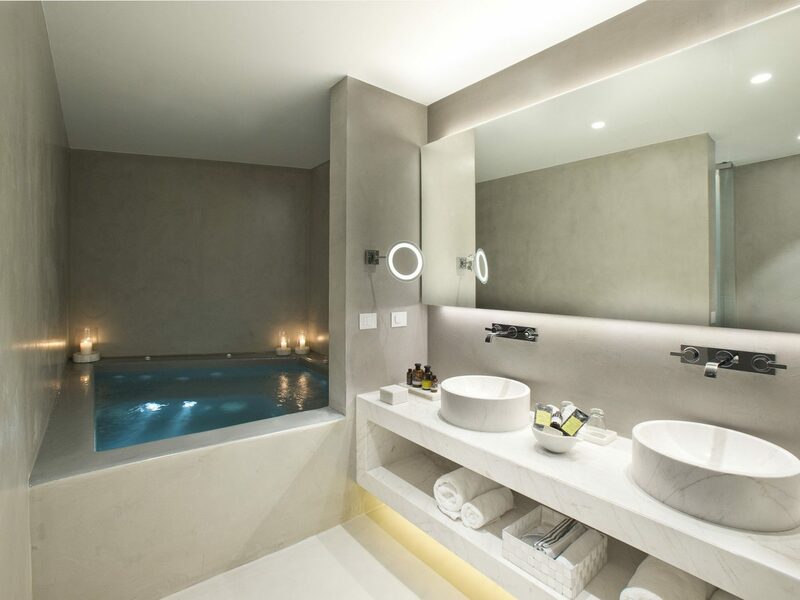 Put a request in for the Grace Suite, which comes with its own hot tub and hammam. 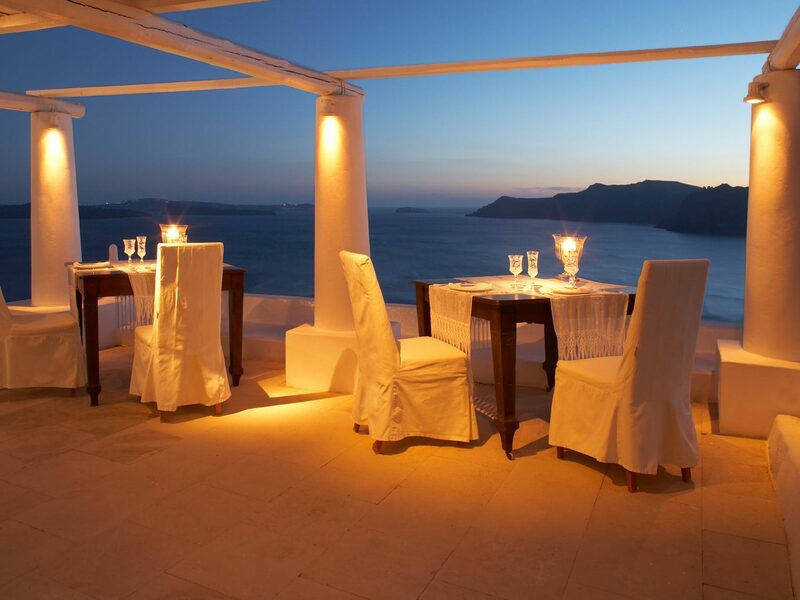 As far as romantic boutiques and sunsets go, you won't find much better in either department than Katikies. 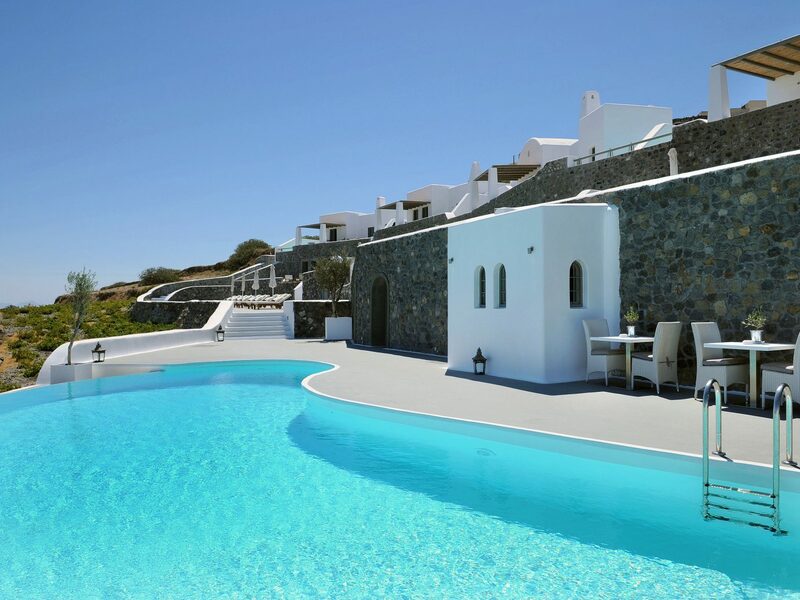 The property features not one but three infinity pools in addition to 34 cliff-side cottages, all of which look out over the submerged caldera. 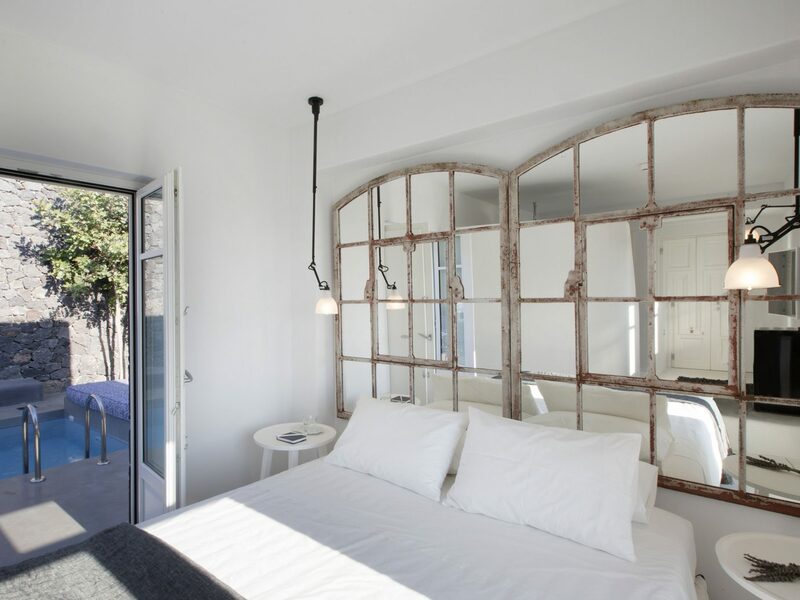 Inside, the look is modernist and spare—arched ceilings; antique pottery; loft bedrooms with picture windows—but even the most standard rooms have private terraces (while the honeymoon suites come with their own alfresco whirlpool tubs). 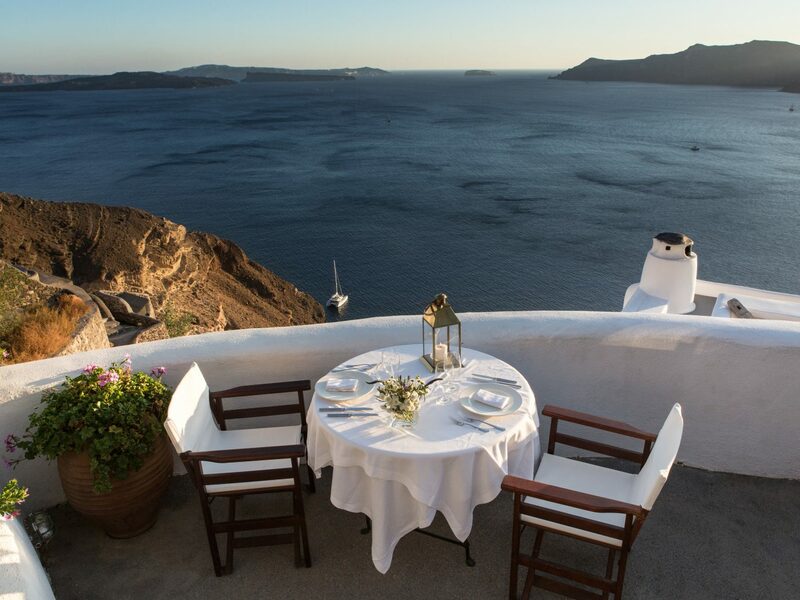 You won't go wrong with dinner at either of the open-air restaurants, but we suggest grabbing a candlelit table at the namesake Katikies and ordering a bottle of local assyrtiko wine. 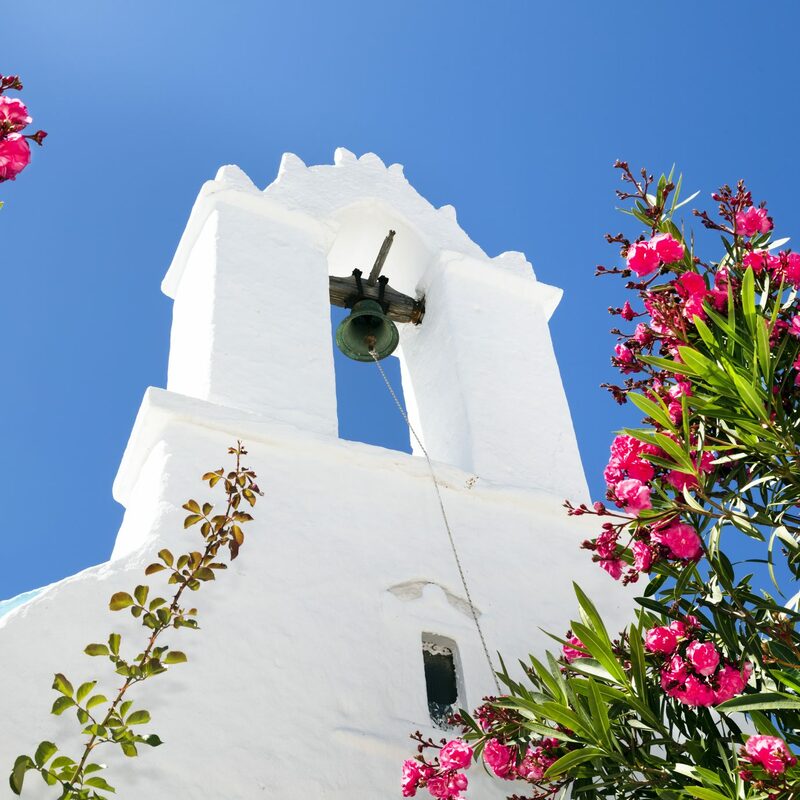 We love how traditional the Greek Island experience is at San Antonio. After all, why mess with what works? 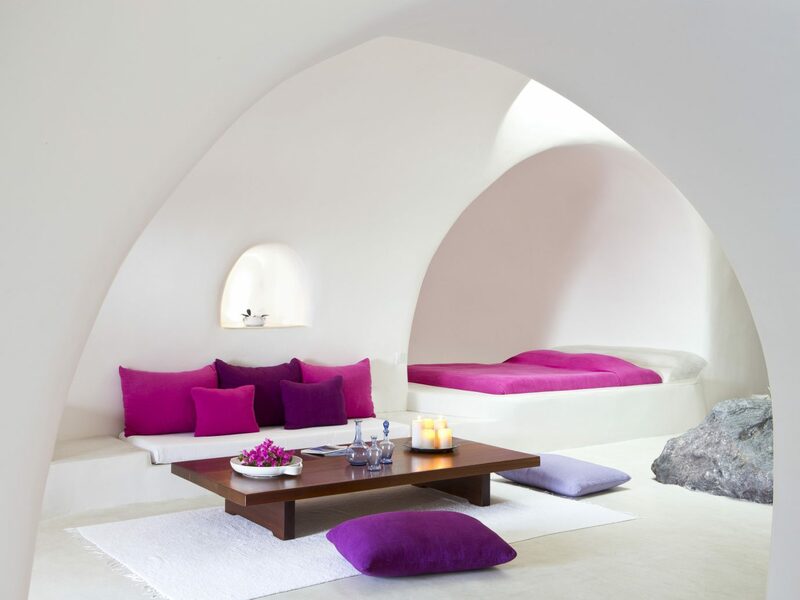 The 29 rooms are whitewashed, hewn out of the volcanic rock, and decked out in pastel hues and feather beds. 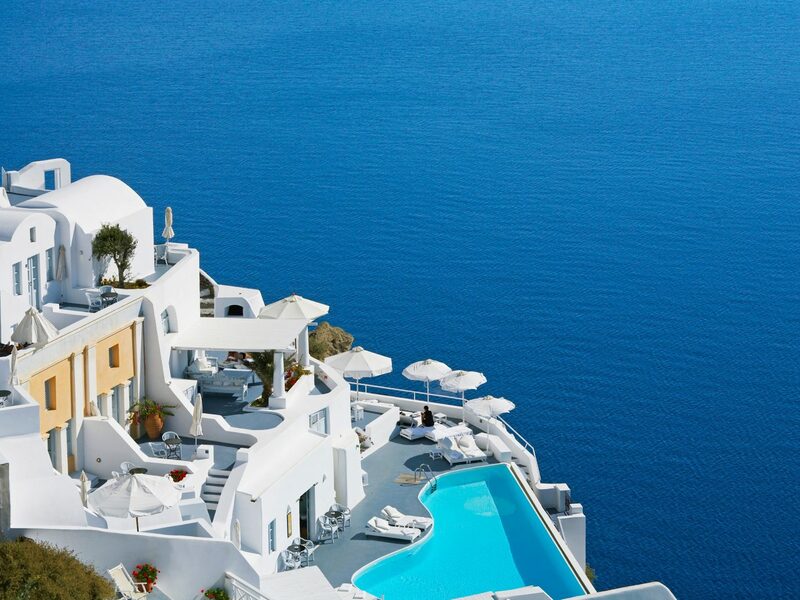 You'll find jaw-dropping views of the sea from every terrace and balcony. 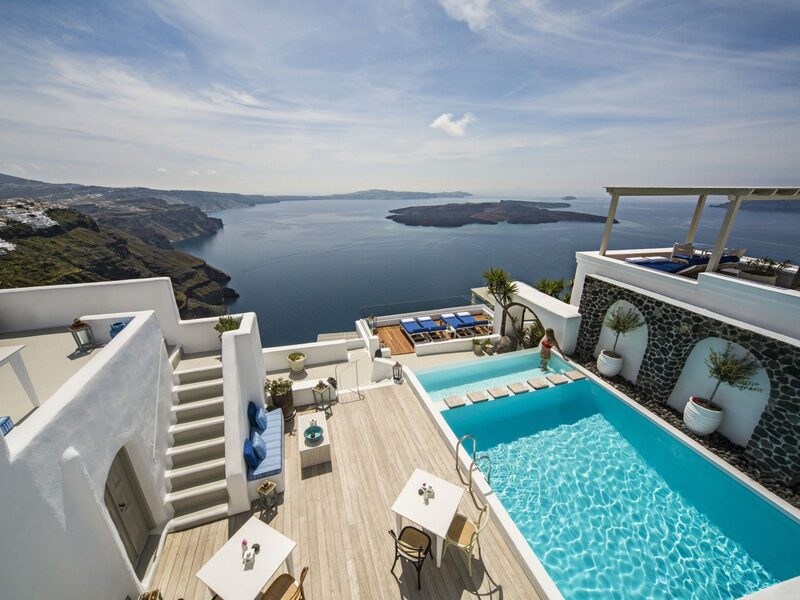 The pool is as Instagram-worthy as you could hope for. 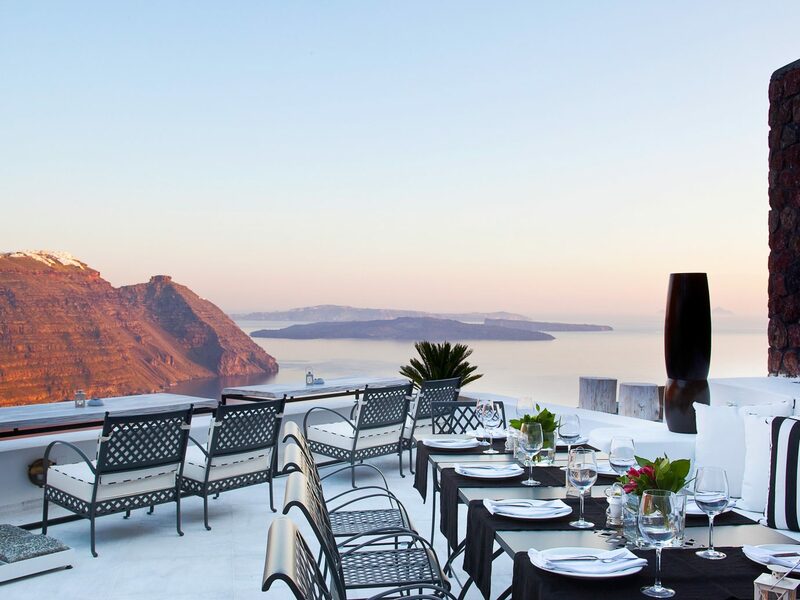 And the open-air cliffside restaurant is not only romantic; it sources every ingredient in its dishes straight from the island—from the yellowfin tuna with avocado to the lamb confit with truffle and mushrooms. 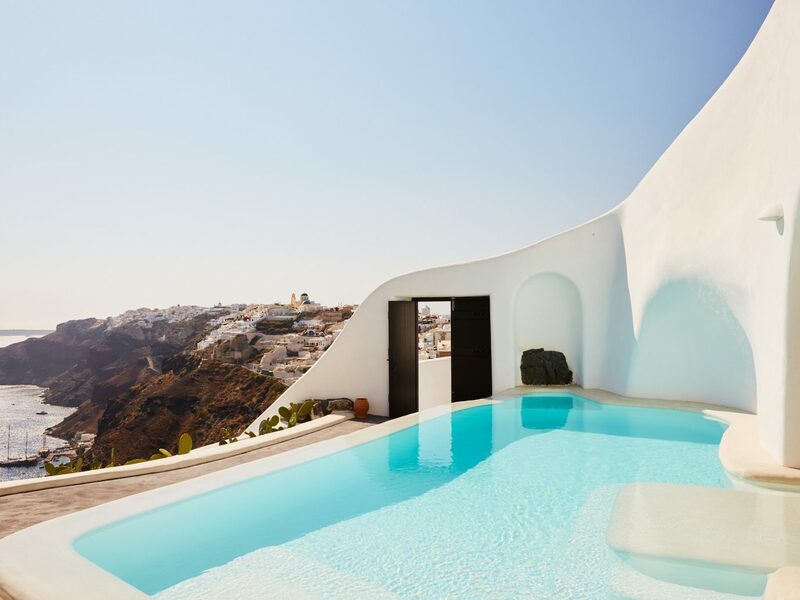 This beautiful island hideaway is, like so many other hotels in Santorini, perched above the Aegean in the cliffs of Imerovigli. But that’s where its likeness to others stops. 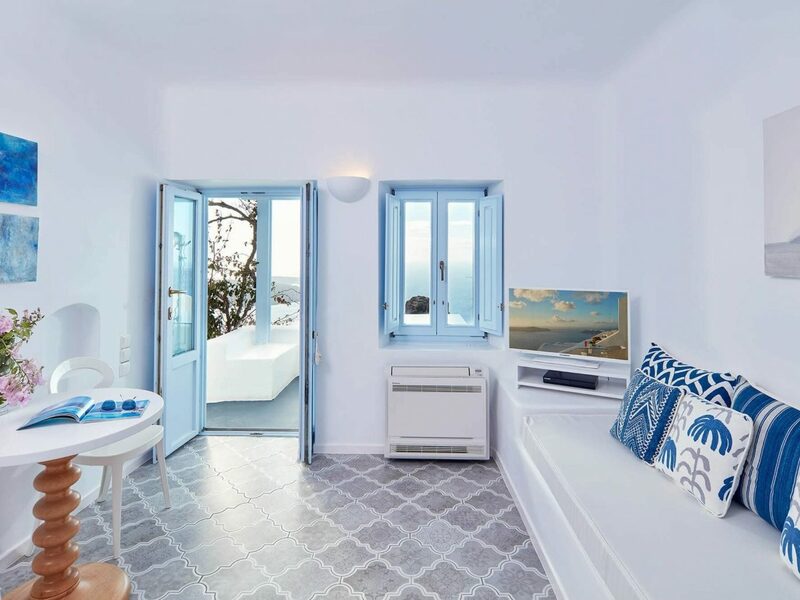 Arranged around the central pool are 26 suites, individually decorated with eye-popping details like unique wood and marble art and bold color splashes on the walls and floors. 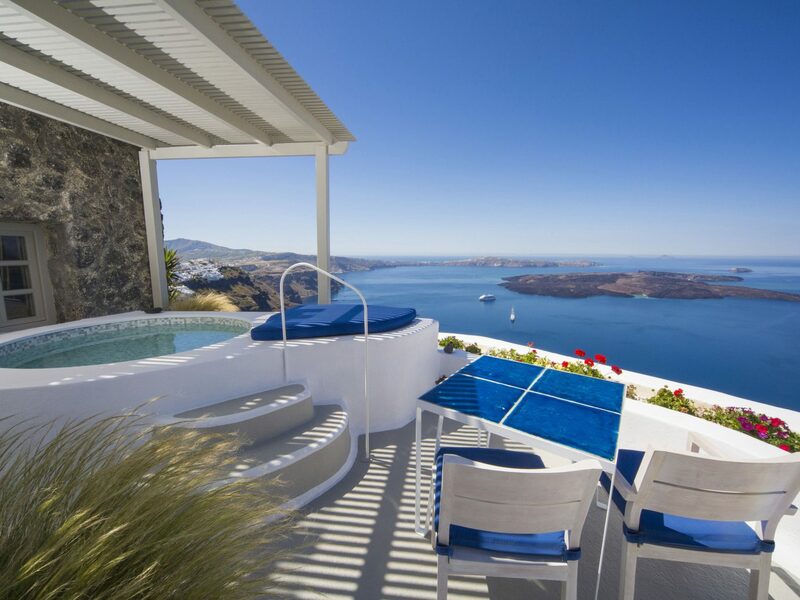 Outside, you’ll find views over the Skáros Rock at almost every angle. Even more impressive is the service: it’s attentive but unobtrusive—hard to see but impossible to miss. 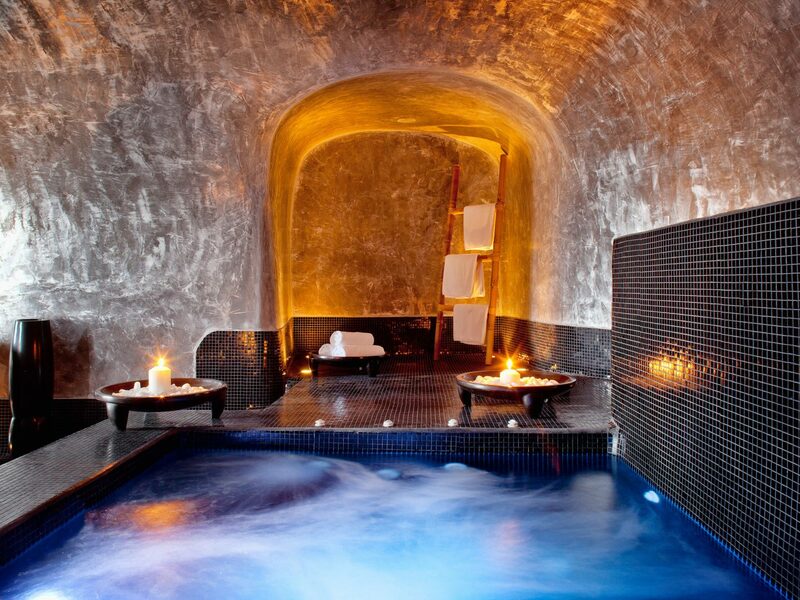 Follow up an aromatherapy facial and massage at the spa with sundowners at the poolside bar. 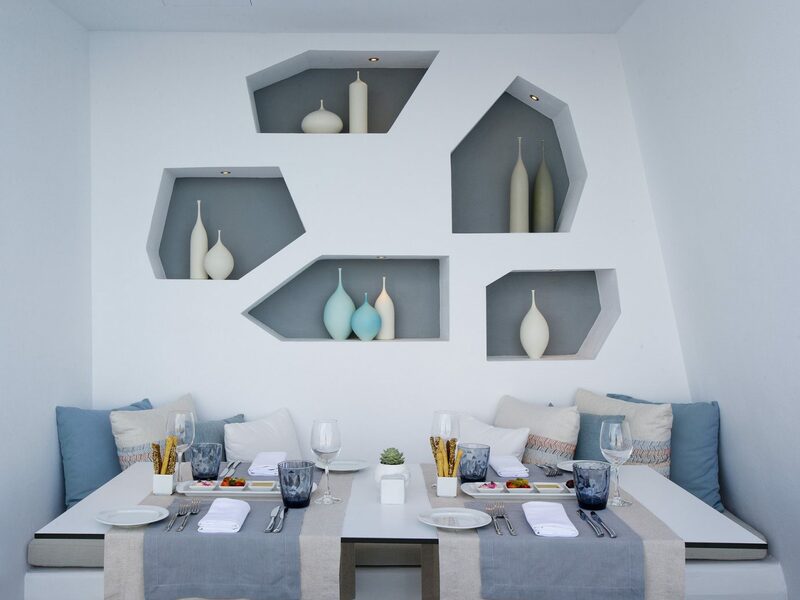 It might not be in the heart of the island, but that's just the way we like it at Canaves, whose position just outside Oia keeps it separated from the foot traffic and noise of downtown. 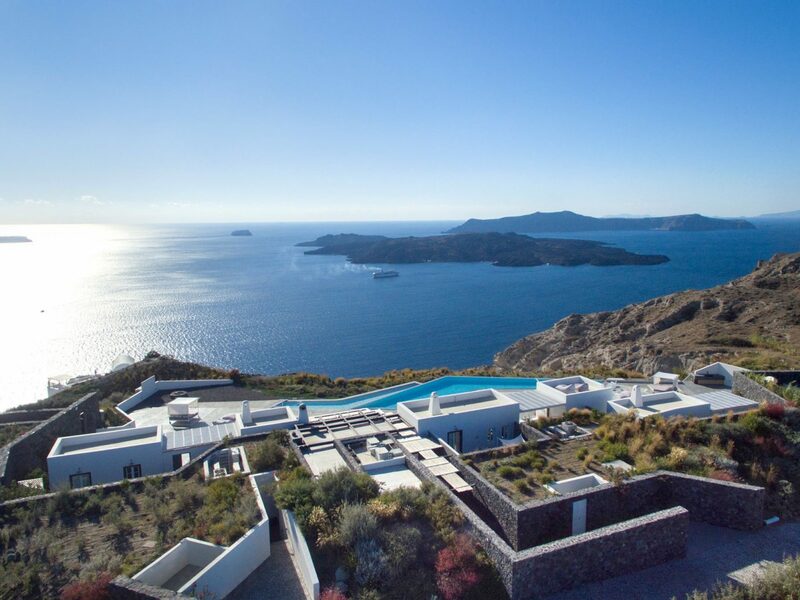 The views, it must be said, are no less spectacular: Imerovigli and its surrounding islands on one side; Oia and the caldera on the other. 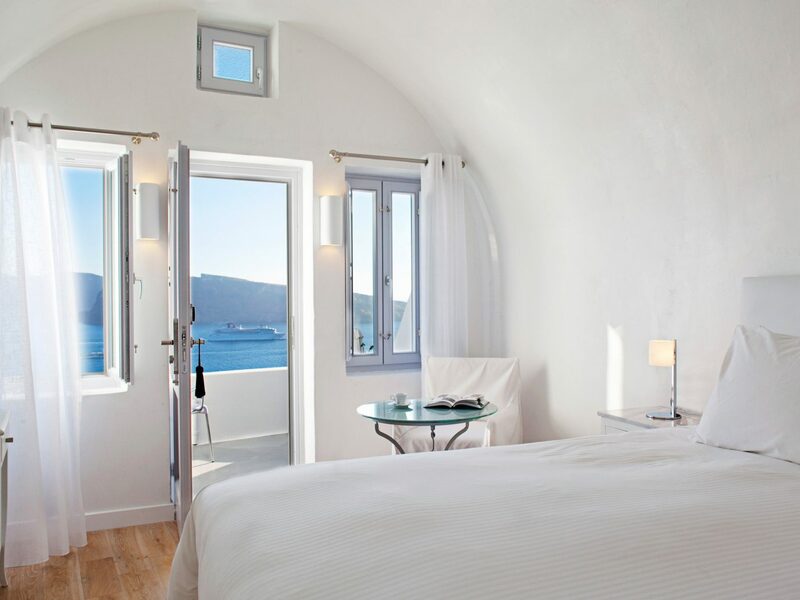 The 41 rooms and suites are divided between two properties, but both have tranquil pools overlooking the Aegean, restaurants serving fresh seafood and Greek wines, and an atmosphere that remains relaxed and serene well past sundown. 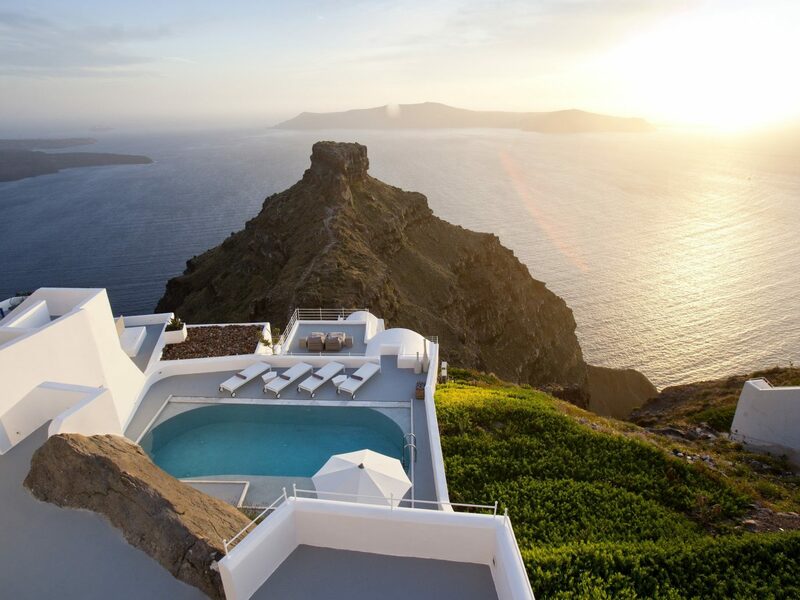 "Drama" is a byword for this private, two-acre, cliffside estate. 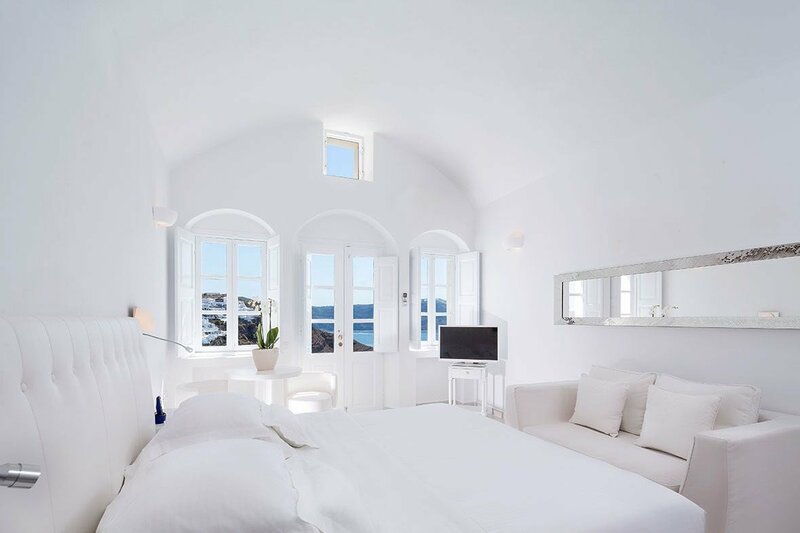 The property's timeless Cycladic design (all 90-degree angles and a monochrome palette of blacks, whites, and grays) keeps the views at the forefront—but there’s far more here than just panoramas. 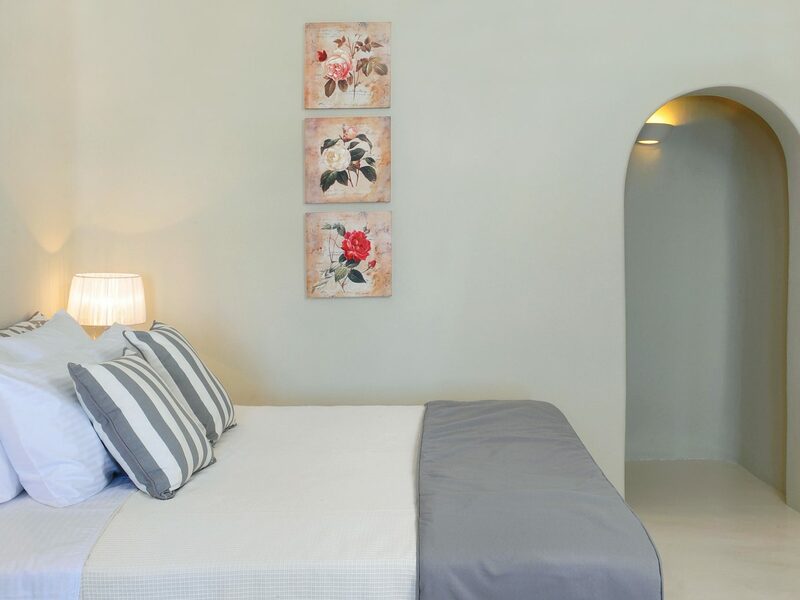 Cow-print bathrooms, mirrored headboards, and floating fireplaces add a dose of playfulness to the four standalone bungalows, while a full staff including a concierge, chef, and masseuse cater to your every wish, be it an ice-cold beverage by the infinity pool or a catamaran cruise excursion. 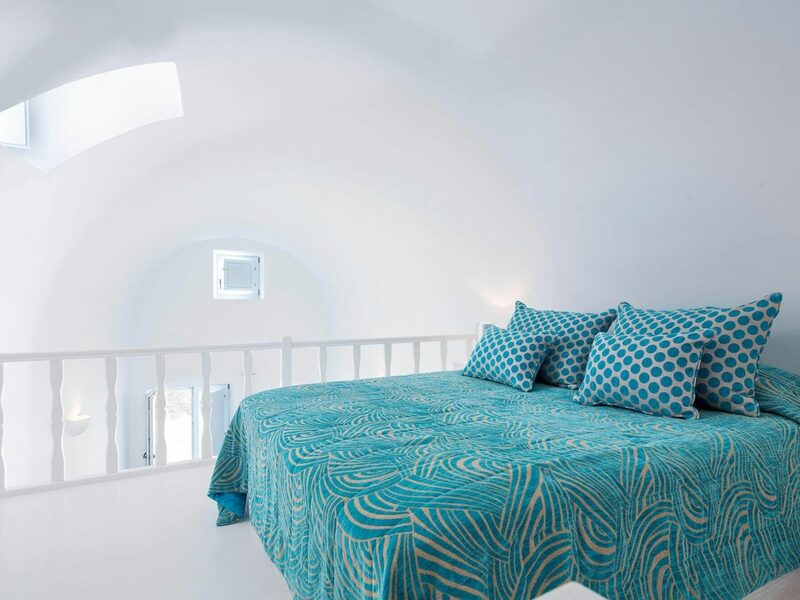 It's not too often we'd consider “cave-like” a good look, but it works wonders for Iconic Santorini, whose five levels of terraced suites were carved directly into the hillside of Imerovigli (the highest settlement on the island). 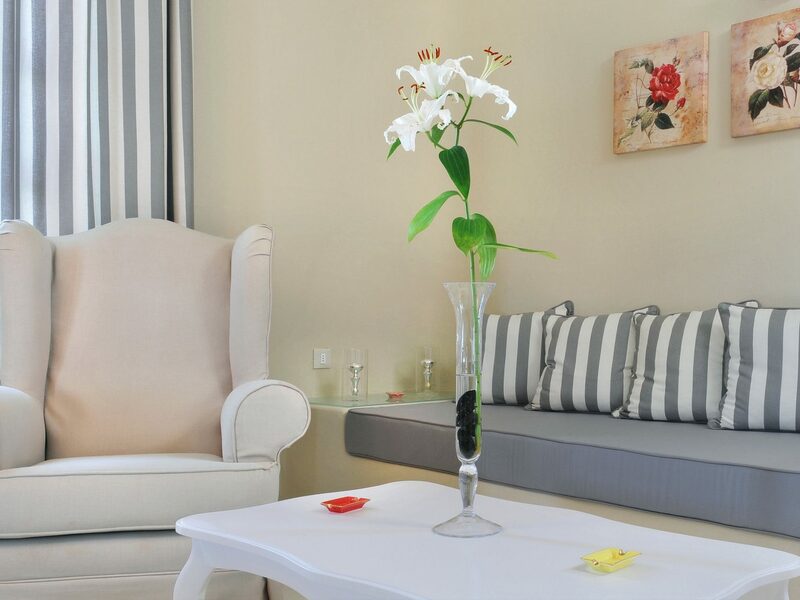 Whatever that sounds like, you're far from roughing it. 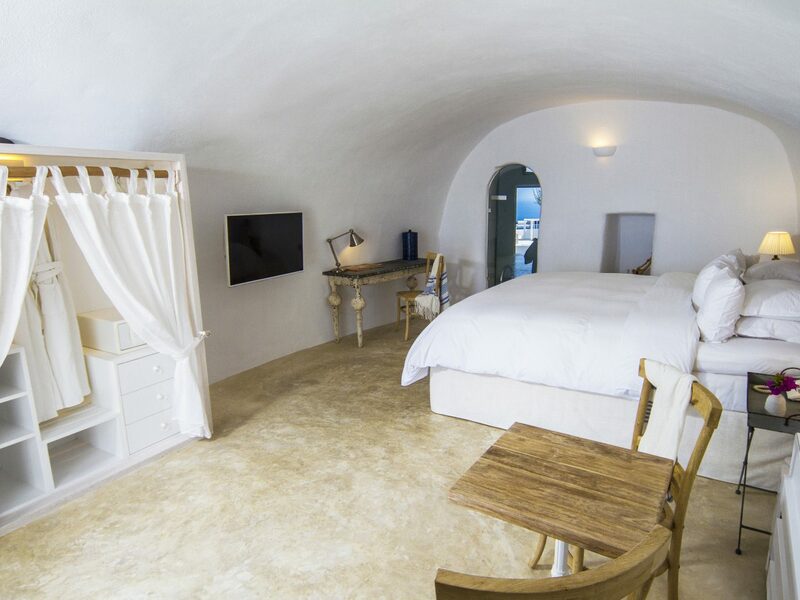 Four-layer beds, rain showers, and speedy WiFi that reaches out to your lavender-scented patio terrace are just a few of the luxurious perks—though it's the Grotto Suites you should book if you want to stay inside an original cave dwelling and have your own indoor whirlpool. 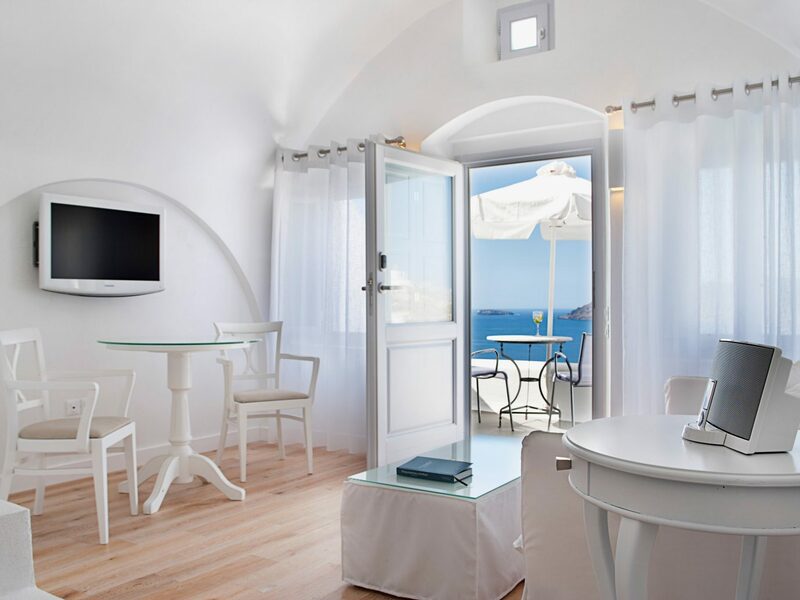 Breakfast is served directly to guest rooms, but it’s worth dressing up for dinner at Pergola, whose locally sourced ingredients (mussels; fáva; octopus) are as delectable as its jaw-dropping Aegean views. 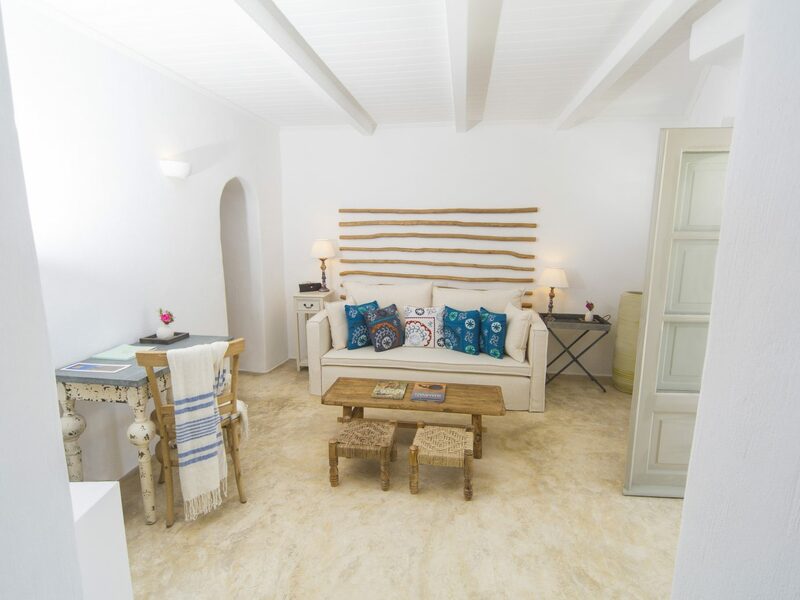 You won’t find a single TV at Perivolas—but that’s just fine. 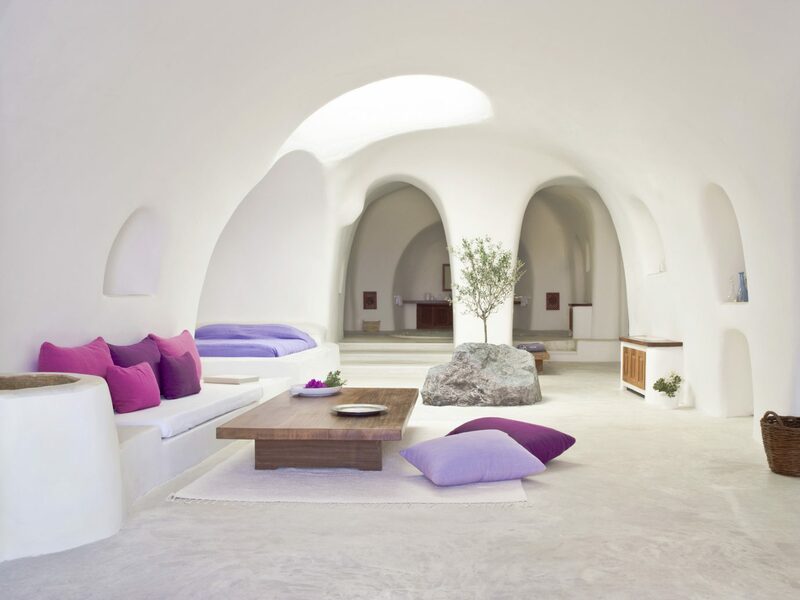 Its 300-year-old converted cave dwellings, retrofitted with kitchenettes and skylights, provide all the atmosphere you need, as does the Mediterranean restaurant’s terrace overlooking the Aegean and adults-only policy (so you never have to compete for wading space in its famous infinity pool—the first to be built on the island). 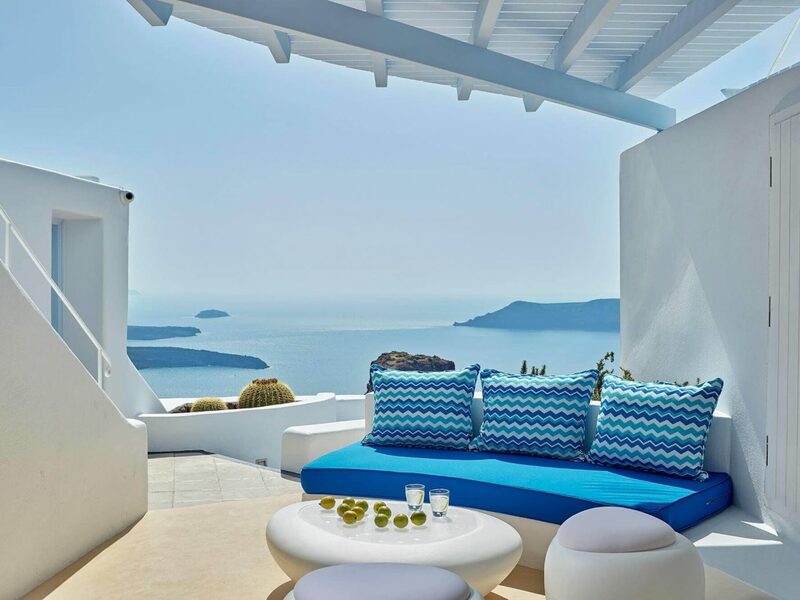 After digging into contemporary Greek specialties like grilled octopus or shrimp saganaki, work off some calories at the gym and spa before swinging by the in-house library for your afternoon read. 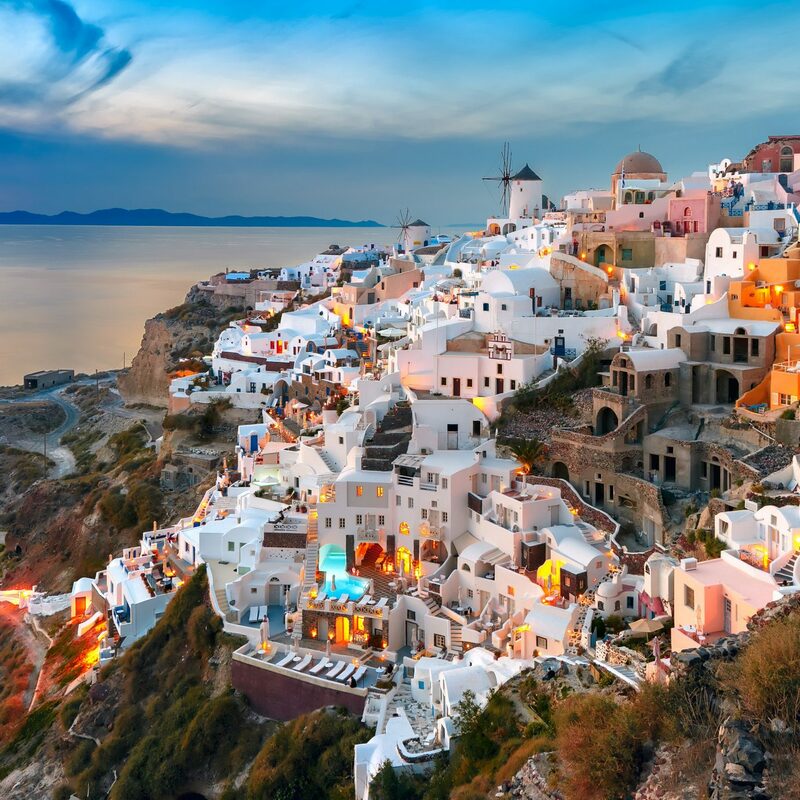 Its location beneath the medieval town of Pyrgos (i.e. 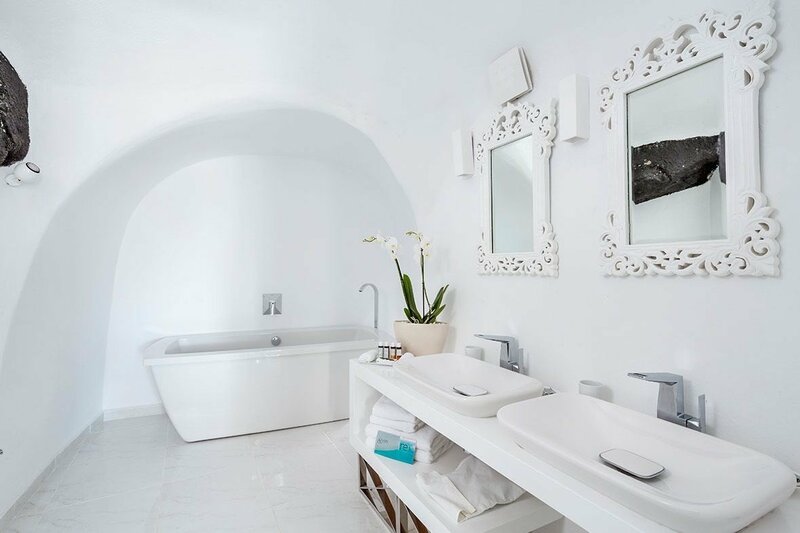 not along the coastline or above the caldera) keeps the crowds away from Carpe Diem Santorini—making it a perfect escape for in-the-know honeymooners seeking that much more privacy. 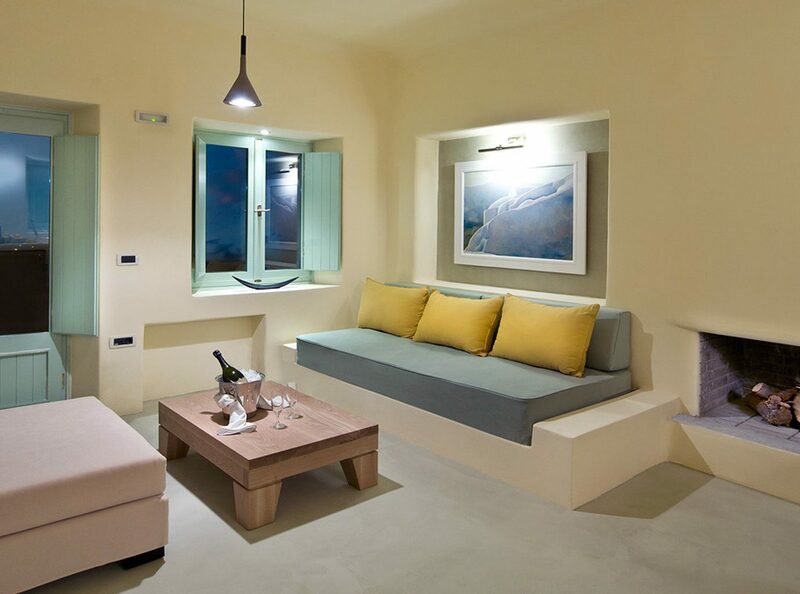 At just 10 individual suites, you’ll feel like you have the place all to yourself. What that entails? 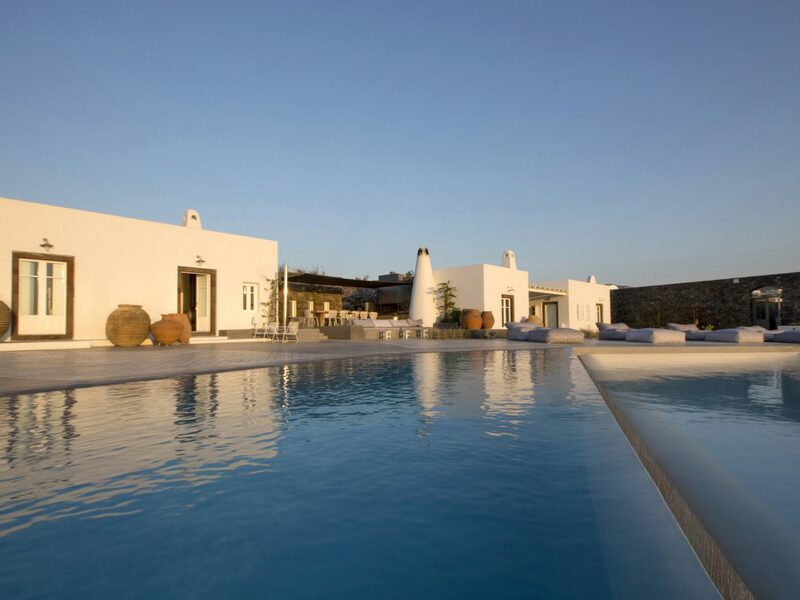 Tiered levels of rooms, each with their own private plunge pool and terrace affording panoramic views of the island’s meadows and ocean beyond. 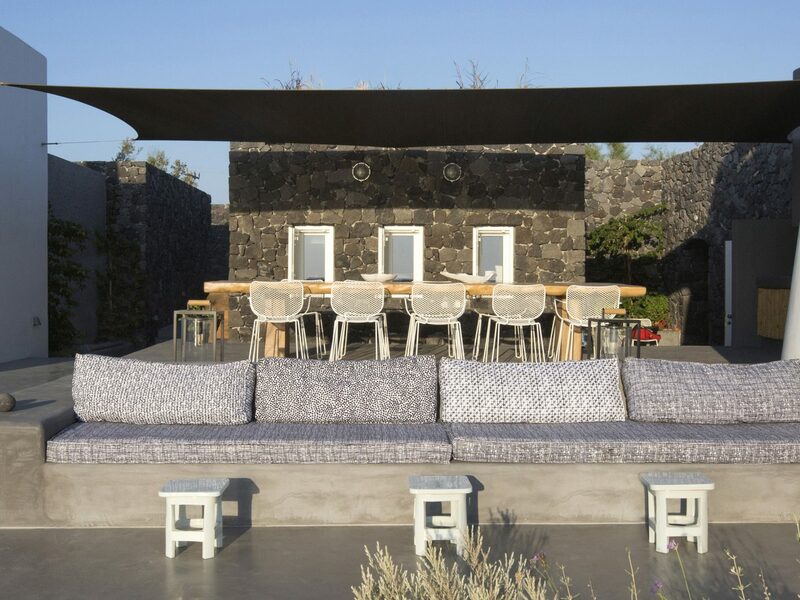 In fact, the only time you’ll be reminded there are other guests is at dinner (the restaurant is small but spectacular) or the bar, where you can watch the sun set over the capital city of Firà.